Although I think Netanyahu fashions his party as somewhat centrist, a good percentage of the Likud faction is solidly nationalist/rightist. And it has been assumed that Habayit Hayehudi would be a natural in the coalition that presumably will be formed after the January 22nd election by a victorious Binyamin Netanyahu. This has been the case even though there is no love loss between Bennett and PM/Likud Chair Netanyahu. 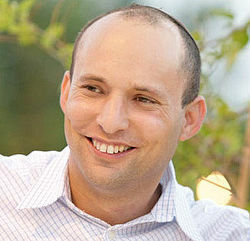 From 2006 -2008, Bennett served as chief of staff to Netanyahu, when he headed the opposition in the Knesset. One gets the feeling that Bennett is fashioning himself a bit as the new and upcoming Netanyahu, capable of appealing to the same voters and ultimately doing it even more successfully . If there is any party head who unsettles Netanyahu, it would be Bennett. Just a week ago, Bennett gave an interview with the sensation-seeking Nissim Mishal of Channel 2. Many commentators have since said that Bennett should have been on his guard with him, because of his reputation for pushy and provocative questioning. Bennett was not. "If I receive an order to evict a Jew from his home, my conscience will not allow it. 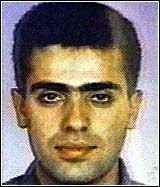 I would ask my commander to release me." He added that he would be willing to serve in prison for this. Following this, Netanyahu went on the attack. He will not have anyone in his coalition who advises soldiers to disobey orders, he thundered -- thereby ostensibly eliminating Habayit Hayehudi from a place in his new coalition-to-be. Bennett -- who served in the elite Sayeret Matkal as a company commander and currently serves as a major in the reserves -- then held a press conference in which he said that the prime minister was distorting what he had said. He was only speaking for himself and did not say soldiers should disobey orders. "...a soldier must obey orders. And if a soldier feels that the command given him is against his conscience, he personally, and I emphasize -- in person -- should appear before his commander, tell him so and be prepared to bear the consequences...if he feels he was given a command against his conscience, then he personally -- it is not a matter of rebellion -- appears before his commander and explains it to him..."
Bennett, it seems, knew whereof he spoke. Either Netanyahu was unaware of this precedent or chose to ignore it. Bennett then went on the offensive. Why is the prime minister worried about a soldier disobeying orders to evacuate Jews from their homes? he asked. Is he planning on pulling back in Judea and Samaria? And with this, the entire political dynamic shifted. Others spoke about not serving because of conscience and of the need to keep all those Jews in Judea and Samaria safe and strong. Most notable was an interview given by Education Minister Gideon Sa'ar three days ago, in which he spoke of his own opposition to the establishment of a Palestinian state, and made a point of saying that the “two-state” principle has never been part of Likud’s platform. Sa'ar, a member of Likud, is in the number three slot of the joint Likud-Yisrael Beitenu list. And so, ironically, in the end, Bennett was the winner and Netanyahu the loser in this exchange. Likud was down in the polls, to 35 mandates, and Bayit Hayehudi up, to 15 -- although of course there is still time until the elections. In the course of all of this, Tzipi Livni was suddenly in the public eye. Livni, who had led the Kadima party in the last election, and then retired from politics when she lost the primary election for head of the party to Shaul Mofaz, has recently re-entered politics. Now she has a new party: Hatnuah, the Movement ("Hatnuah for Tzipi Livni," more precisely), for which she drew seven members from Kadima, thereby totally demolishing that party. Livni, one of those politicians who lives in an imaginary alternate universe, has been castigating Netanyahu for not advancing the "two state solution." At any rate, this week she twice sent messengers to Netanyahu to discuss inclusion of her party in his forthcoming coalition. Actually, she was apparently seeking information on her chances of once again assuming the post of Foreign Minister, which she held in the Olmert administration. There is a specific reason why she hopes this might be possible, and I digress here for the last time in this posting to explain. Avidgor Lieberman, head of Yisrael Beitenu (which is now in a joint list with Likud) has been serving as Foreign Minister. Lieberman has had some charges hanging over his head for years. The more serious charges were dropped recently and lesser charges regarding breech of trust -- concerning matters such as his improper involvement in the appointment of an ambassador -- are being advanced now. Right now there is some new information regarding the indictment against Lieberman, although no new charges have been added. I do not wish to belabor this here. At any rate, Livni obviously saw what she hoped was her chance. Put plainly, Tzipi Livni gives me heartburn. She is bad news -- an incompetent, as far as I am concerned. An incompetent who believes we must surrender our land to make the world happy. My clear understanding is that for many years she has given Netanyahu heartburn as well. It is difficult for me to imagine that he would accept her into the coalition with an understanding that she could have this major position. What is more, Likud faction members to the right of the party have let Netanyahu know that they want Bennett and not Livni in the government. My own take is that when the dust settles Bennett will be in the coalition. The way I see Netanyahu is that he is doing a political balancing act, attempting to be all things at the same time in order to attract the maximum number of voters. It's not enough to win by a narrow margin, but rather, as solidly as possible. The greater the number of mandates his party has, the few other parties need to be in the coalition, and the fewer party leaders he will have to share power with. In a nutshell, that's it. However, since he shot himself in the foot with his attack on Bennett, he has now shifted to the right again. This is what he sees the electorate wants. And so, yesterday, he met with the mayors of major cities in Judea and Samaria and spoke of his support for building in their municipalities. Hopefully this has been enlightening to at least some of my readers. I will track the situation in coming postings as it seems helpful, without become too bogged down in the minutiae. Technorati Tag: Israel and Naftali Bennett and Israeli Elections.